WHAT A COMEBACK! Trailing 4-2 late in the third we tie it up and win it in overtime!!! And Jimmy Schuldt broke the School Record for Points by a Defenseman! Great comeback! Good times! Had all the rally gear on, had to shed the Wild sweater and broke out the Husky hat shirt and gloves with 5 min left and they came through! Go Huskies!!! Need to play more 4 on 4 hockey. Exciting and the energy in the building blew off the roof. Way to go into the bye week, 13 point lead with a possible 18 points left for the Penrose Cup. Get some rest , recharged and can't wait to get back at it! 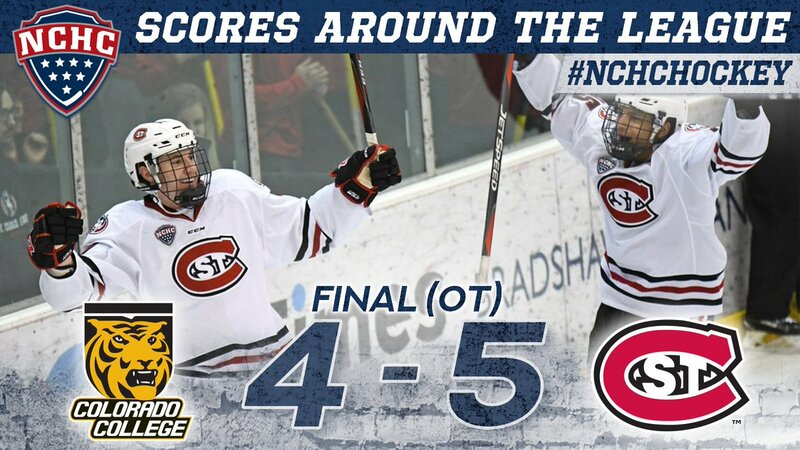 HUSKIES WIN! Be sure to stop by your St. Cloud Tim Horton’s tomorrow morning, before noon for your free medium coffee! Still, really good learning experience for the team and we’ll be that much better for it!